Reminder: click on each picture to get more out of them. Above: Some guests playing Crockett on the Jekyll Island Club House Lawn. On the first day of this month Anna and I took a short break from our hum-drum life and drove down near the southeast corner of Georgia to Jekyll Island. The drive down was uneventful and boring. The longest leg of our journey was the I-16 between Macon and the I-95, near Savannah… more than 150 miles of nothingness… pine trees and more pine trees on and on. In Pooler, a suburb of Savannah, we stopped at Hardee’s to eat. I tried their jalapeno burger, which I thought was pretty good. When we got into the Brunswick, Georgia, area we couldn’t help but noticing the many rivers we crossed while on the I-95. I bet we drove over at least five or six, maybe more.. And they were mostly wide rivers. I remember car-radio station surfing and we came across a man singing something like "I'm fishing for Jesus, I reel them in and He cleans them." We followed the signs and got onto the causeway. We passed a sign saying NO GAS ON JEKYLL ISLAND. No gas? There goes my finger pulling joke. Jekyll Island has two interesting attractions that perked our interests: (1) The historical Jekyll Island Club of the United States elite of the late 1800s and up to WWII, and the sea turtles. (2)Jekyll Island serves as one of the major sea turtle egg-laying and hatching rescue units of the Georgia islands. I think golfing is a big thing here and I think youth soccer tournaments are big too. We had reservations at Hampton Inn, which was beachfront or sand dune front, sort of. But it wasn’t the front, the sea and the beach was around back. There is a thicket of trees between the motel and the dunes, maybe about 200 feet. But the hotel has a raised walk, or long walking bridge to the sand. Then the water is only feet away, according to what time the tide comes in for the day. The motel was covered with teenage soccer players, mostly girls. We gravitate to the historical area most of the time. The historical area is where the millionaires’ cottages, clubhouse, and the beautiful landscaped lawns are. The whole section, sort of a ghetto for the super rich overlooks the Jekyll River. There is a pier there, which we checked out. On the pier was a gift shop, a boat for dolphin tours. Two restaurants: one outside and one inside. The outside restaurant had a live band playing and the inside was, well, inside. We chose to eat in the inside one, Latitude 31. Both restaurants are owned by the same. They said the price was $50 for two hours or $75 a day, only $25 more for 22 hours more. But again, $25 is $25*…. But again, for the cost of a meal we could be having a ball driving around in the little flying saucer looking mobile. *Once at a county fair a pilot with a small plane was selling short plane flights. An old farm couple walked by and looked interested. They said how much and he told them $50 for both of them, $25 each. He could tell they felt $50 was a lot of money but he knew what to say to entice them. He said, if they could keep from saying anything during the flight he would refund one of the fares, which was $25.00. He was pretty sure they would be amazed at seeing their home town and probably their home from high up they would probably say something excitable. The old couple climbed into the back and they took off. He flew over the little town close by and didn’t hear a word behind him. He did loop, thinking that would excite them into words. It didn’t. He tried another loop. Silence. He landed and only the man was sitting there. The pilot asked where was his wife. The old man said the pilot made his loop she fell to the door but held on for a minute and then he did another loop and she fell. The battery powered Red Bug has been around since the Jekyll Island Club was in its prime. It is named after the Red Bugs that migrate and infest the island for a short time annually. Above is one the first ones on the island. Back then they had races on the beach on certain days of celebration. There were huge trees with huge limbs curving to the ground with Spanish moss hanging all over the place. We got to our motel. We walked out to the beach via the long wooden walkway (see picture above). At one point on the wood bridge there is a wide area with built-in bench seats. A group of pre-teenage boys were sitting around talking. I remember sitting around talking about things with friends when we were pre-teenagers. We talked about ghosts, is there intelligent life beyond our planet? And many other subjects, including the mystique of females. I might could carry on a conversation with them about ghosts, flying saucers, conspiracies, but women? I have no idea. It was nice and peaceful hearing the surf pound and the sound of water gushing against itself. We went back to the hotel and dropped by the bar and got drinks then went up to our little balcony on the 3rd floor and listened to the waves some more. Then, we watched a movie on a Blockbuster DVD we brought with us on Anna’s new laptop. We were not sure if it would work or not. It did. The next morning we got up before sunset and went back to the ocean edge to look at the sunrise. It was something. Look! I took a picture. Also on the beach were a lot of hoof tracks. Each track dug into the sand. Our feet hardly made a mark on top of the wet packed sand, but I figured the hoofs were more pointed. A lady nearby told us the day before she was there about 8:30 and saw deer walking near the water’s edge. Why? There were so plant life close to the water line; the salt water probably is not good. My cousin Johnny said, “Maybe they just like to look at the ocean like we do.” Mysteries of the universe. The Hampton Inn boasted of free breakfasts so we took them up on it. After we had eaten we rode around and explored the island some. I think I read the island is either 9 miles long or 13 miles long. We drove to the southern part and saw the soccer fields with lots of uniforms mingling and playing. Up on the north end is Driftwood Beach. At Driftwood Beach a lot of people were enjoying the beach and the water. I noticed a lady carefully photographing something silvery on a chain hanging from a large piece of driftwood. Nearby was someone talking to her, who looked amazingly like Paul Giamatti, although I didn’t realize it until I spoke to him and we made eye contact. I asked him what was that she was photographing. He said it was a Christmas ornament she made. He went on to say in all her travels she always shows the Christmas ornament with an intended background. A teacher at a high school in Marietta has photographed his teddy bear, I think it was, all over Europe. Next to Driftwood Beach is the Fishing Pier. We were killing time for the tour of the Historical Area that we had planned on going on. We arrived for the tour just minutes before boarding time. I normally make it a point to count how many people are on things like this, but catching this statistic slipped my mind. Although, I did observe that every seat in the carts the jeep pulled was occupied. The tour guide was Wes. Wes knew his job very well. Wes also plugged the bookstore and mentioned buying books and other merchandise from the Museum gift shop was an excellent way to pump money to the restoration of historical buildings on the island. We were inspired and bought Arcadia’s Press’s THE JEKYLL ISLAND CLUB by Tyler E. Bagwell. If I remember my facts correctly the club’s membership was limited to 100 members. They were all very well off and just about all of their names were household words, such as Rockefeller, Pulitzer, the guy that owned Singer Sewing Machine (that is a household sentence), Marshall Field, J.P. Morgan, and others that don’t come to mind at the moment. Someplace I read or heard that at one time the members of THE JEKYLL ISLAND CLUB made up about 6% of the world’s wealth…. Or was it 1/6? It was a club that was created for the elite, so that they may interact with each other, in ways other than business, more of a social environment, with hunting, fishing, golfing, and other play toys at their disposal. During the tours I found out that the help just didn’t use the main stairs of a house. The only reason they would have to be on the family stairs was to be working on it, like dusting or maintenance work. After all, they were servants, I’m sure the members felt. So, most houses, if not all, had a separate set of stairs for the hired help. Another subject I found interesting of the times back then was ladies’ make-up. Before a lady applied her makeup she first applied an application of a mixture which was mostly honey comb wax. After she applied that and I suppose she had to wait until it dried, then she applied her rouge, lipstick, and all of that sort of stuff. Being that wax was involved, I think it probably had a melting point. What if it was a super hot day? Or in the winter she got too close to the fire place? And the fact that it was made of a honey comb probably attracted insects by the scores, so not only is your face sliding off, but it is also covered with bugs. That could be embarrassing. 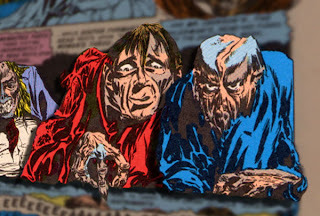 The thought of a face rolling off a woman’s head reminded me cartoonist Ghastly Graham Ingels’ work in comicbooks like TALES FROM THE CRYPT. Here are some members’ houses that are looking towards the Jekyll River. The same day I am preparing this post Anna talked to a friend in her mid 70s who lived in the Brunswick area as a teenager. She said they all went over to Jekyll and played around while the houses were in their disrepair period. She said the little ponds and fountains at the Crane residence were crawling in snakes. After the tour we visited my first cousin Johnny and my cousin-in-law, Jeanie. They have a very nice house in a very nice subdivision on the far outskirts of Brunswick. They prepared a great meal and I think we all chatted rather nicely. Jeanie and I have known each other since she and Johnny were married about 42 years ago and that night I learned that she spent several years in Iran as a teenager. I didn’t know that. Jeanie is very energetic – almost like a power plant. I bet she is never lost for words or what to do next. She is hyper in a way, and in a way that makes things happen. They have some type of body of water behind their house that has a connection to the Atlantic. The water goes up and down with the tide. Johnny said there is a gater out in those marshes too. Johnny and Jeanie both work and the next day was a work day. So, all good things must come to an end, we said our goodbye’s and ambled back to the motel. By the way, that reminds me, when we first entered Jekyll Island you stop at a booth you have to stop at pay $5 a day for your car to be on Jekyll. You can also buy a 3 day or a 5 day pass cheaper. And a year pass which would be a whole lot more cheaper. Well, five days was out of the question, but a three day pass, would just fit, because one day we planned on not leaving the island anyway. The girl taking money suggested just buy for one day, you would have money. We went around and around about that, saying I would really prefer the three day pass, just for the convenience of it And she more or less said, that I really wanted a one day pass…. I noticed cars backing up behind us. The lady was taking all the time she wanted to convince us a one day pass was in our future. I said, I really wanted a three day pass, because then we could come and go off the island …. Now, the cars were backed up over the river bridge and out of site. OK, those cars made me nervous, some were honking now. “OK, give me the one day pass”. Which we saved money. I paid for two one day passes for a cost of $10. The three day pass would have cost I think $15. We saved $5…. But I also lost my freedom to come and go off the island at a whim if I wanted to. Well, we didn’t have enough time to get everything done on the island anyway. So, I win! I think. The proprietor of the Red Bug Rentals is a very gentle and friendly man who at one time lived in Marietta. I was not willing to pay $75 for 24 hours so he came up with a very generous counter-offer which we jumped at. For the next several hours we rode around the island from one end to the other and exploring the little small narrow streets around the gift shops and the historic district. It was an enjoyable jaunt. We stopped at a pizza house next door to a miniature golf and a big golf course to buy a pizza. We got it to go and went back and got into the Red Bug and I could not get it to start. Incidentally, the pizza place was owned by the same guy that owned the Red Bug Rentals, therefore, they have Red Bugs delivery vehicles. The delivery person came out and tried to get it started and it would not start. He called his boss and his boss came over and after the owner and the delivery man discussed it they decided nothing was wrong with the Red Bug but the fault was the operator, namely, me. They told me to not have my foot on the accelerated pedal. It will confuse the computer and lock down. Duh.. OK! Up on the north end of the island is the remains of William Horton house, who I didn’t realize it until we read it on the historical plaque and Anna read it in the book that he was second in command when James Oglethorpe brought colonists to Georgia. Across the road is the du Bignon family cemetery. They owned the island and sold it to the Jekyll Island Club. According to the book, the first du Bignon, a Frenchman is buried there in an unmarked grave, but under a tree that grows freely, which I suppose symbolizes his life style. I think he was a pirate….Really! Aaarrggggg! That is probably the tree standing between the other markers. We returned the Red Bug and met up my first cousin, once removed; John is the son of Johnny and Jeanie, whom we had dinner with the night before. John showed us around and pointed out some additional interesting things. I really appreciate what he did. He is a very sincere person who is very knowledgeable of the history and administrating. He does eye contact very good. He is not shifty eye like his first cousin, once removed. We ate dinner at the Crane House. Crane was one of the superrich Jekyll Island Club members who made his fortune in bathroom and plumbing fixtures. We made it just in time for the Early Bird Special Dinner. I think Early Bird Special translates to “Microwave the leftovers!” It wasn’t very good. Our waiter was very nice and talkative. He is a Brunswick native. He has just returned from owning a lounge in Atlanta that had featured live music every night. His establishment was in a hotel owned by a foreigner. When the hotel went under, it dragged his lounge down too. He lost nearly a hundred grand. The next morning we got up, ate a free breakfast the last time on the trip, packed up the car and left. One thing we had planned to do but hadn’t yet been to was the Turtle Center. We did then. It was very educational. I learned a lot about sea turtles that morning. One of the docents told us very proudly that a turtle came on shore last night and laid 36 eggs. He was beaming like a proud uncle. We thought he was a street kid. He was wearing a wool pull over cap.. stocking cap? He had a youthful way about him that you do not associate with people in the scientific and nature study community. But after talking to him we learned that he just returned from studying turtles on the coast of Africa. In a building, also on the premises, was a sea turtle hospital. Each turtle was in a tub-like body of water. They were patients. One was found nearly dead suffering from a boat blade slicing his shell. Pictures were posted beside the tub showing the before and after. Many of the turtles was floating on top very lazily, with just occasionally waving their huge fin-like hands to move a little. Most of them had gas and floated like, well somebody with gas. They were trying to de-gas them before releasing them back to their habitats. If all they can do is float they cannot swim to the bottom to eat the aquatic plants, so they will stave. The building that housed the turtle hospital was a power supply plant back in the olden day. After the turtles we figured it was time to leave. We drove off the island and stopped at the Georgia Pig BBQ for lunch. We were their first customers for the day. When in Brunswick is the place to try Brunswick Stew – because that is where it originated. I think the Georgia Pig stuck pretty much to the original Brunswick Stew recipe. It had plenty of veggies, mostly okra with little hunks of pork. I thought it was pretty good. Then we took the advice of my cousin Johnny and our waiter at Crane’s and took the back roads to Macon. It was much more interesting then the trip on the way down. More about Jekyll Island's members controlling 6% of the world's wealth:Whether it is actually recorded or not, the figures are constantly adjusting itself whenever somebody comes and goes from Jekyll Island, or any other island. The numbers change constantly as to what percent of the wealth in the world at any moment in time on any map spot. Thus when we entered Jekyll Island, and somebody in the outbound lane left, I'm sure the value of the wealth on the island dropped a fragment of a point.... then, when we left and at the same time another car entered the value of the wealth on the island probably rose a fragment of a thousandth or something. It is nice to know we made a difference.